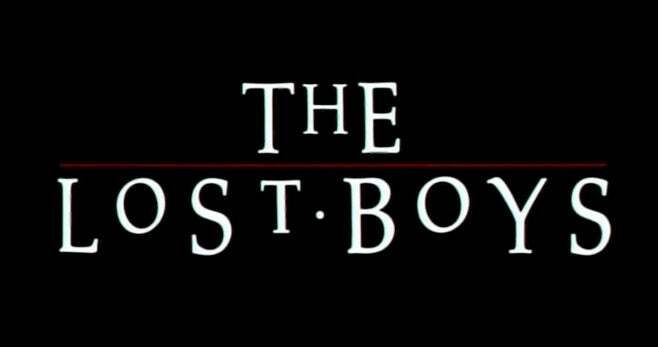 The CW is becoming known for rebooting older properties and giving them a fresh take, and one of the next projects on their list is a new TV series based on the 1987 horror film The Lost Boys. The pilot is currently in production in Vancouver, and according to Movie Hole, the show already has its logo. Fans of the original film will notice some similarities to the old logo with a few extra tweaks. “As you’ll see, the logo is significantly similar to that used for Joel Schumacher’s classic film version but with a small but noticeable difference – there seems to be a drop of blood coming off the T,” Movie Hole writes. The first episode of the teen vampire show is being helmed by Twilight director, Catherine Hardwicke. According to a previous report from Deadline, Tyler Posey (Teen Wolf), Kiele Sanchez (Kingdom), Medalion Rahimi (Still Star-Crossed), and Dakota Shapiro (Valley of the Boom) have all been cast in lead roles for the pilot, which is being written by Heather Mitchell. Mitchell is also producing the show alongside iZombie and Veronica Mars showrunner, Rob Thomas, as well as Dan Etheridge, Mike Karz, and Bill Bindley. The show is expected to follow two brothers who move to Santa Carla, California with their mother after the death of their father. The boys will quickly find themselves immersed the secret underworld of vampires. Sanchez is set to play Lucy, the mother (originally played by Dianne Weist), who escaped the town many years earlier when she ditched her boyfriend to run off with another man. Posey will be playing Michael (Jason Patric in the original film), Lucy's oldest son whose plans to attend medical school were thrown off by his own medical diagnosis. Shapiro will be playing the bad boy vampire, David, who was originally played by Kiefer Sutherland. Rahimi will play Stella (a role originated by Jami Gertz), a young woman who befriends Michael. The Lost Boys isn’t the only vampire content coming to television. A series based off the 2014 horror comedy What We Do in the Shadows premiered on FX last week. There is also a Vampire Chronicles pilot in the works from Hulu based off of the Anne Rice novels of the same name. What do you think about this potential Lost Boys logo? Tell us in the comments!